Fitness equipment is now available at Meigs County EMS for use by county employees. POMEROY — In an effort to promote a healthier workplace, fitness equipment is now available for use by all Meigs County employees. During their regular meeting last week, the Meigs County Commissioners approved a shared use agreement, along with Meigs County EMS Director Robbie Jacks and Creating Healthy Communities Director Ciara Martin, to allow the use of the equipment by all county employees. 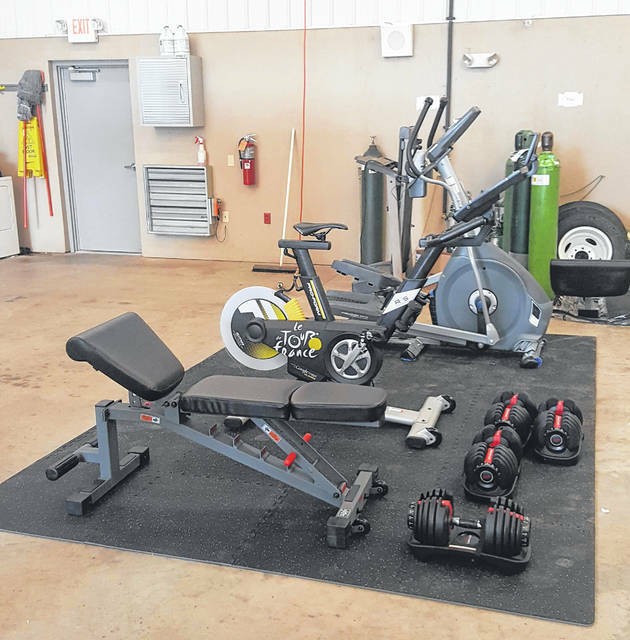 The Creating Healthy Communities program that is funded through the Ohio Department of Health purchased exercise equipment to be housed at the Meigs County EMS facility, explained Martin. This exercise equipment is to be used by all Meigs County employees. “Utilization rates are being tracked, and a satisfaction survey will be conducted to determine the effectiveness of the project,” said Martin. The fitness equipment is the newest part of the plan to improve the health and wellness of the employees of all county offices. The commissioners also recently approved allowing for county employees to take an extra 30 minutes on their lunch break, up to three times per week, if the time is used for walking or other fitness activity. In other business, the commissioners conducted a bid opening for the 2018 County Resurfacing Project, parts 1, 2 and 3, which will include the paving of several roads, including portions of Portland Road, Rocksprings Road, Leading Creek Road (the short side toward Middleport), Storys Run and Pomeroy Pike. The lone bid was in the amount of $1,384,813.22 from Shelly Company of Thornville, Ohio. The bid and accompanying information was referred to the Meigs County Engineer for review. A resolution for the engineer’s office was also approved for the annual pavement marking project. A bereavement policy was adopted for county employees to clarify the current policy. The updated policy allows for employees to take three days bereavement leave for an immediate family member and one day for other family members. Employees may also use up to three additional sick days. Fund transfers and appropriation adjustments were approved as requested by the auditor and sheriff’s office. A request from EMS to appropriate $106,129 into the EMS Supplies line item was approved. The funds come from the EMS certified funds line item for the purchase of a new ambulance. This is the third ambulance purchase in as many years without having to take out a loan to make the purchase. A check for $430 was deposited into the house arrest line item for common pleas court as reimbursement for GPS monitoring for Charles Roush. The commissioners meet each Thursday at 11 a.m. in their office on the third floor of the Meigs County Courthouse. https://www.mydailysentinel.com/wp-content/uploads/sites/14/2018/08/web1_8.8-EMS-Fitness-Space-2_ne201887111245240.jpgFitness equipment is now available at Meigs County EMS for use by county employees.